B U B B L E G A R M: Mini Shopping Trip! Yes, more skincare products! This is what I got yesterday! Currently my face is going through a bad stage of hormonal acne, it attacked again because I didn't balance my hormones by taking my Liv Cleanse Complex this month! Also, I feel like my Neal's Yard Jasmine enriching cream is just a bit too much to use during the day and night in the summer as it's very rich. Therefore, being on a budget I picked up this vanishing cream from Boots, it's supposed to vanish on your face creating a moisturised matt finish - which it does. So far so good. I also picked up the toner as I was out of my Neal's Yard orange flower water which seems to finish suprisingly quickly - a very expensive addiction indeed! The danmask rose skin tonic smells beautiful and how cute is the bottle? :) Yes I'm a HUGE sucker for packaging! My skin is less angry and calm at the moment, the lighter option seems to be working, now I have to get rid of my scars from picking and squeezing - Eeek! Still in keeping with the budget mode, I remembered my Mac Fix + had finished but this time I decided to get spring water in spray can form instead. Evian does it but for some reason Boots do not stock it anymore and this La Roche posey was my other alternative. It's a French brand that was recommended to me from a skin care expert quite a while back. I'm really liking this so far, it has been a great refresher throughout the day and quite nice to use to set your make up. 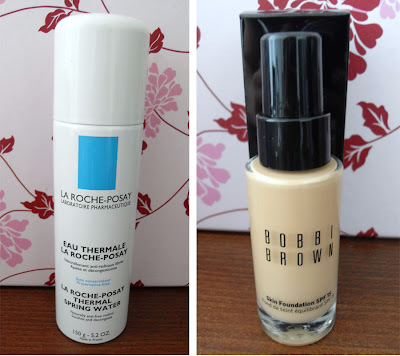 However, not in keeping with budget mode, I finally picked up the Bobbi Brown skin foundation, I did a review a while back. It's a very light liquid formula and is basically supposed to feel like skin - perfect for the summer! Oh and i'm so pleased this has a pump! I've been following you anonymously for a long time now, and i can sincerely say that your blog rocks! I have very bad stretchmarks at the moment, and have tried plenty of creams and potions, and clinical treatments, but have not come across anything that's actually effective. Is there anything you can recommend or maybe write a post about? @Linsey Hi :) Thank you so much for your kind words! Stretch marks, well that's quite tricky... I myself have tried a few things but nothing really seems to help like you said. Bio Oil is quite good, but its possibly more of a preventation than a cure. I shall do some more research on the subject and do a post on it in the future. i bought the skin foundation a few months ago, and i looove it. its not moisturizing at all though, so i do find its best to pair it with a light layer of tinted moisturizer. what are your thoughts? definately loving BB right now! The rose water/toner is very very good.. i never tried the vanishing cream. Cant wait to hear what you think about it. La roche posey is not that well known in the UK, well it is but not talked about that much. Same here when it comes to packaging :) I love vintage, and they are glass bottles, sooo cute! If i'm happy with this then i will buy everything else they sell, as its not that expensive compared to most brands! I have recently started following your blog and i love your articles. I bought the vanishing day cream as well but somehow i thought towards the end of the day it was little bit oily in the T zone. did you notice that as well?? no not really, i have relatively dry skin so i was ok... maybe try applying less on your t zone to prevent it? I am a huge fan of La Roche Posay products, I commonly use the Effaclar range and the Spring Thermal Water is always in my closet. It s very refreshing and I use it as a toner. Take care, sweety! My skin is also suffering from acne at the moment and I also have my cheeks full of scars and redness! Lush also has a Vanishing Cream. I used it and it was great. All these products look great. I'm going to need to try some. I hope you're skin will be much better Inshallah. I was only wondering, if there is an substitute for 'the neals yard jasmine enriching cream'? Here in Holland we don't have a Neils Yard. I'm struggling for years now with my acne and I stil didn't found my HG product that make my acne dissapear.I also have an combinated/oily skin. Maybe you have an idea. Not been on your blog for a while i LOVE the header. Beautiful. Do you like the Boots stuff? I reviewed it a while back and I think its pretty damn good for what is a budget range. I can't seem to stop playing around with different skincare brands. I always love seeing your hauls, no matter the size hehe. I can't find any form of 'water' or 'tonic' here in JA...bummer. I can't wait to see a couple photos with the skin foundation, i really wanna try it myself. Thanks girls, expect a fotd soon, the skin foundation is amazing!!! I ran out and bought the Damask rose tonic on your recommendation! and my gosh!-it is amazing!!!! My skin felt softer and had more glow. I too have the NY Orange flower water but after using the NE for 4 days i noticed a few spots which is a shame-and plus it does finish quickly as you mentioned!-As if it evaporates!! I also like the cute vintage packaging, the tonic is awesome-thanks for sharing! I may stock up seeing as boots have it on offer now too! Keep up your great work and reviews-i love reading your blog! I forgot to add: Please update on how you are finding the Boots vanishing cream if you can, as i too have sensitive skin and it would be great to know what you think of it. I love the packaging- so old school! Wow, i didn't know there was a pomegranate one too! There is a cold cream rose cleanser that is just like the ponds cream that i want to get my hands on too! Seriously this rose water tonic is way better for my skin (and wallet) than the NY orange one! I'm glad you like it and it agrees with your skin too!, sometimes its hard to find quality products that actually work for sensitive/really sensitive skin. The range is a really good find..thats for blogging about it, if it weren't for you then i most likely would have walked striaght past ! Hey, does the skin foundation work like a tinted moisterizer? What kind of a finish is it?